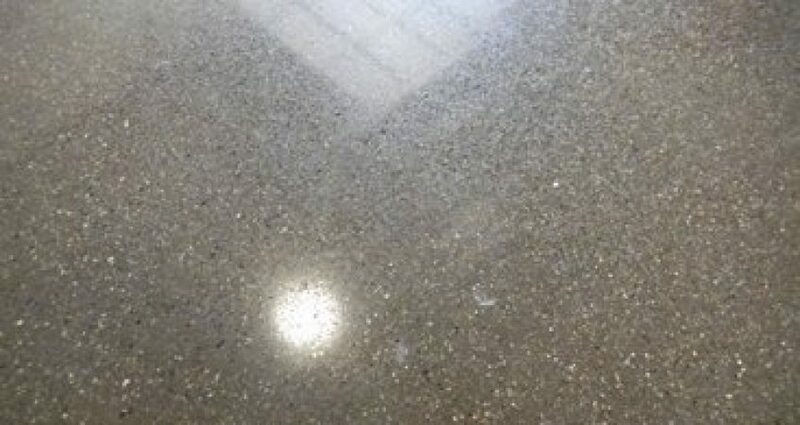 How to Polish Concrete Floors | All Stone Restoration, LLC. Keep your concrete floors looking their best. A concrete floor makes for a spectacular finish, indoors and out. To keep your floor looking its best, regular cleaning and occasional polishing are common practice. Not only will maintenance keep it looking like new, but it can extend the longevity of your concrete floor. To effectively polish your floor, you will have to work the floor in stages, using disks of different textures. To get the most out of your polishing efforts, check out these tips. Before you begin, clean the floor. Remove debris and dirt with a broom, and gather everything for removal with either a dustpan or a vacuum. Fill a mop bucket with water and add mild detergent. Mop the floor’s surface as a means to clean any residual dust, moving swiftly and steadily. Mild stains and spills will be removed as you mop, too. Ensure that you allow the floor to dry or wipe it dry before you begin polishing. Use a coarse-frit polishing disk to polish the floor (preferably one that measures 500). Coarse grit is extremely effective at getting rid of stubborn stains and rough areas on the floor’s surface. Start at the end of one floor, moving from side to side until the entire floor is completed. It is best to use circular motions with this disk. The fine grit polishing disk will lift any residual stains, leaving the floor surface looking clean and uniform. The circular motions will ensure that all rough patches are cleared through the coarse and fine grit action. For the final stage, use a polishing disk with the finest grit, such as 1500. This will give the concrete floor a nice, glass-like sheen. After this stage, any staining or blemishes should be completely gone, This is the only stage where overlapping is encouraged! Use the floor grinder to apply concrete floor polish over the whole surface. This final step should give the concrete floor the extra sheen to make it sparkle and impress! For knowledgeable and skilled contractors that can help you with your polished concrete needs, contact the team at All Stone Restoration today. We have over 47 years of hands-on experience in all phases of stone and concrete restoration. Contact us today to get your free on-site estimate.